Shaun Jedju on his rounds. Step into history and take a closer look. The picture shown here was originally published in the Tuesday, December 26th, 2017 Exponent Telegram. It highlights monuments and grave markers near the Harrison Family Plot. We would like to take this opportunity to share an up-close in-depth look at this area by providing pictures that have been compiled over several years. This area is approximately in the middle of the cemetery just to the right of the middle throughway. The following images are close-ups of the fallen markers close to where Shaun Jedju is standing. I am so excited to see that all of the Harrison/Mayburry headstones are still there!! I’ve been so afraid that some of them wouldn’t be found. My dad, now almost 92, will be so excited! Thanks so much for posting these photographs. Would you mind if I posted these to their memorials? I am honored to be of assistance and glad to have brought you good news regarding the headstones not having been lost or stolen. I am also glad to hear that your father will be excited about this as well. You are more than welcome to share to their memorials. We are working to raise funds to reset these markers and others starting this Spring. 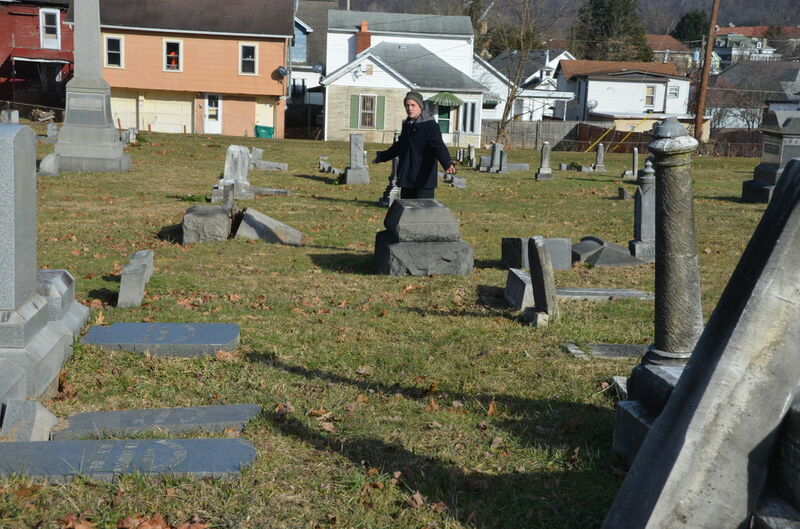 I will be sharing the progress on the restoration of the former IOOF Cemetery on South Chestnut Street as it is made. Thanks again for leaving your comments. Here are the identities of 2 of the Harrison headstone photos. (1) Top row, 3rd photo: “Susan M. Harris” is Susan Mayburry Harris, sister of Anna Mayburry Harrison. (2) Row 2, 4th photo: “Elizabeth M. Jones” is Elizabeth Mayburry Jones, also a sister of Anna Mayburry Harris. I have written bios on all of the Harrison-Mayburry family members and have started posting them on their memorials on Find-A-Grave. As your team does research through local records, it would be terrific to add any additional information. Also, I have a other family members in the cemetery…we are related to many of the Clarksburg families…and have information on them as well. I’m happy to share all of it with you if you are assembling a repository for each individual. Have you been able to locate any records of burials and plots? That would be so helpful, especially where headstones are lost. I would really like to help with the restoration of the cemetery and of the Harrison headstones. Would you have information on how to tackle the headstone restorations? Also, please keep me touch with how I might be involved at the cemetery in the spring. I am not local, but would love to visit and help. I’m so excited that the cemetery is being restored and so grateful to you and your foundation. If it would be easier to discuss the details by email or phone, please feel free to do so! Thank you Nancy for sharing the information on those Harrison Family Headstones. We are working on assembling a repository for each individual and would be honored to have a copy of the information you have on these individuals and any others you are willing to share. If able please forward it to use through email, you can email me directly at Shaun@notagenericserver.com We currently have a digital copy of the original burial ledger, but there are some instances of missing information so we have reached out to local funeral homes and are awaiting responses. We also have the original plot map as well as a surveyor’s copy based off the original plot map. I appreciate your offer of assistance and will be more than happy to provide further information regarding the restoration of the cemetery and the Harrison Headstones. We are working on a few ways to tackle the restoration work. We are pursuing a collaborative project with the Harrison County Historical Society to have one or two workshops on the grounds of the Former I.O.O.F. Cemetery where we hope to learn the skills and knowledge so that we can continue the effort of resetting over 100 fallen and sinking markers. I will do my best to update the website as well as reach out to you personally regarding the dates of these restoration projects either by email or phone, whatever works best for you. I also can be reached by phone, text message, email, or Facebook. Thank you again for your offer and I look forward to further discussions with you.